35,000 students about to take their exams took part in the Graduate Barometer carried out by trendence every year. The study focuses on students’ expectations about starting a career, careers in general, and the most attractive employers. This means that the study is the most significant employer ranking in Germany. The Schaeffler Group is one of the most popular employers among engineering and business students. The student portal Absolventa has awarded our Trainee Programs with the Trainee-Seal. 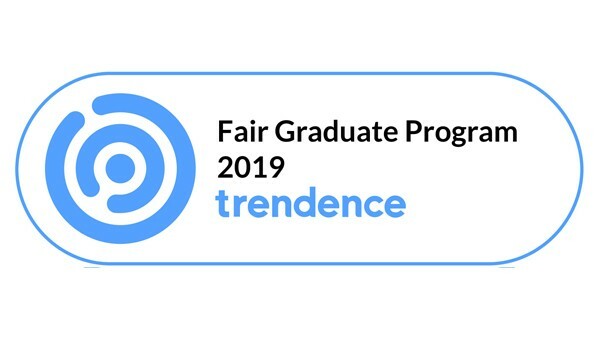 The trainee award features career-enhancing and fair trainee programs and offers graduates guidance when searching for a high quality trainee program. Schaeffler as an attractive employer recieves the „TOP-Company“ Sign of the valuation platform Kununu. Employees are able to vote here for topics like leadership, colleagues, equality, communication and image. In the 2018 CLEVIS survey about internships Schaeffler has won a Star Award with above average values ​​in employer quality and brand image. The CLEVIS survey is Germany's largest study on employer quality and brand image through internships. 5,000 interns have reported their experiences in 2018. Also the Student Survey from Universum reveals how students perceive organizations as employers in Germany. The respective ranking from 2018 is based on the answers of about 45,000 students from 140 German universities. These surveys look at the attractiveness of the company as an employer and asks the future academics about their plans for their career and life in general. We are particularly pleased to learn that students and graduates associate core elements of our Corporate Culture such as team spirit, work-life balance or career development opportunities with the Schaeffler Group. Schaeffler is one of the most popular employers for young professionals in Germany who are just embarking upon their careers. This has been shown once again by the Universum Young Professional Survey, in which Schaeffler achieved 23rd place among engineers. As part of the MINT Minded Company Initiative, students as an academic target group propose companies that make a special effort to promote the MINT idea. Schaeffler is highly committed to the promotion of MINT talents.